Early years education has been recognised as a potential force in providing equal opportunities for all children, regardless of the situation into which they are born. 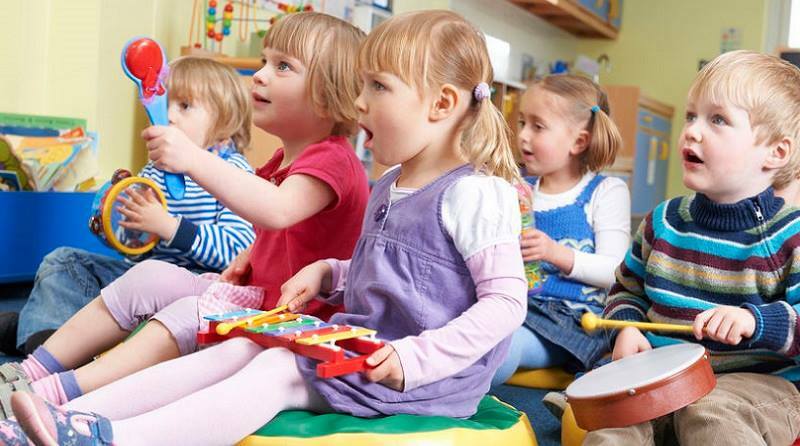 Having delivered early years music in parent groups, nursery groups, and even teacher training sessions, I have seen several areas in which music has changed lives. It was the early 80’s and we had been called in from outside play in the early afternoon – very unusual at my nursery. Not sure if we were about to be told off, we sat down and after a while, a new lady sat in front of us with a guitar. Singing and playing the same songs we sang at nursery, we were spell bound. By the early 90’s I had taught myself to play the guitar. Positive experiences are powerful in the early years. Bowlby wrote extensively on the importance of a primary care giver, while Bandura’s experiments with an inflated “Bobo” doll showed how likely children would be to imitate behaviour. This tendency to imitate is often used by early years teachers in teaching action songs. Early childhood music education researchers, like Bernarr Rainbow (1981), wanted to see how accurately young children could keep a beat. Rainbow found that children were better at keeping a beat by walking than clapping, and even then, fewer than half of them could match the beat accurately. By the late 2000’s, I was taking my guitar to local nurseries and singing nursery rhymes, along with my own new little baby. I started learning songs that were new to me, yet out of copyright they were so old, and began attending specialist music courses over weekends and summer holidays, full of skipping, jogging and games. In fact, a music composer called Emile Jacques-Dalcroze found that adults, too, were better at keeping the beat with their feet than their hands back in the early 1900’s – even highly proficient musicians! He trained them to associate natural movements like walking, jogging and skipping to musical rhythms, and greatly improved their ability to perform any musical piece, not just the ones they had practised. During the late 2000’s, I started a distance degree in psychology and, learning how to research, discovered that the most respected science journal, Nature, had published a study by Laurel Trainor (2006). It showed that children who had had a full year of specialist music sessions improved their ability to learn, sparking off interest in the academic benefits of music. Additional studies tried to show that listening to classical music improved learning (“Mozart effect”), but very quickly, this was proven to be as effective as chewing gum while studying – effective in the short term, but no long-term benefits. More recently, a primary music teacher in Bradford, James Rotheram, was in the Guardian, crediting his school’s improvement from special measures to outstanding as a result of increasing the average student’s music instruction from 1 hour to 6 hours per week using the Kodály approach. This singing-based approach is currently being trialled for its educational benefits in a project being funded by the Education Endowment Fund. After I finished my psychology degree, alongside publishing theme-based preschool music teaching manuals, I had caught the research bug and began a part time master’s degree at Cambridge, specifically focusing on the types of music activities most successful with preschool children. I found that children responded best to activities where they were not personally singled out, activities involving instrument play, and improvisation involving creative movement and creative instrument play. My own studies confirmed that children learnt most effectively through Kolb’s process of experiential learning: concrete experience, observation, conceptualisation (understanding), and experimentation. Kodaly’s ideas of presenting, preparing and practice are similar, and can be extended by Kolb’s concept of experimentation – or in musical terms, improvisation. The importance of improvisation, or imaginative musical play, was also emphasised in Susan Young’s (2009) work, developing ways to create opportunities for children to use their experience to make up new songs. While searching for an opportunity to complete research training through PhD study, a group of experienced education and healthcare friends and I created Think Cre8tive Group C.I.C. Focussing on the emotional skills not being met through traditional educational and medical training, we are taking on projects overcoming different health issues and building emotional resilience through music intervention. The effect of music in diseases including dementia and Parkinson’s are becoming better known, while studies on music for depression and anxiety are gradually starting to surface. The lack of side-effects from music, unlike medication, is welcoming, but further study is needed to confirm whether merely listening to music or actually performing music produces the same benefits. Studies in singing for health are becoming more common, with significant benefits being shown in areas as different as loneliness in the elderly to COPD (chronic obstructive pulmonary disease) and post-natal depression. This is particularly exciting in the area of resilience in early years, but requires significant changes to the focus of early years training. In preschool education, the question has always been why some children achieve and others do not. Now we know that opportunity, background (family income) and interactive communication make a huge difference in final career training and choices, income, and independence. The question now is whether there is any experience or training that may compensate for background/income. My money is on music. sic education business Musicaliti. Frances is passionate about creating the best opportunities possible for children through the medium of music. As part of her business, Frances delivers music sessions in primary schools, pre-schools and afterschool clubs for babies and toddlers in Bolton. During these sessions, children are inspired to create music using a wide variety of music materials. As part of her work, Frances also teaches specialist music education techniques to early years providers. Frances is the author of “Learning with Music: Games and activities for the early years“, which was published by Routledge in August 2017.